Cro-Magnon Man is a name applied to the earliest known European examples of Homo sapiens sapiens, modern human beings. Cro-Magnons lived from about 40,000 to 10,000 years ago in the Upper Paleolithic period of the Pleistocene epoch. All modern human lineages, Cro-Magnon among them, most likely radiated from East Africa. For all intents and purposes, the Cro-Magnons were anatomically modern, differing from their modern-day descendants in Europe only by their slightly more robust physiology and larger brain capacity. When the Cro-Magnons appeared in Europe about 40,000 years ago, they brought with them sculpture, engraving, painting, body ornamentation, music, and the painstaking decoration of utilitarian objects. The geologist Louis Lartet discovered the first five skeletons in March 1868 in Abri Cro-Magnon, the Cro-Magnon rock shelter at Les Eyzies, Dordogne, France. Found during construction, the rock shelter contained a large cavity that protected the fossils. The date of the fossils has been placed at approximately 32,000 years ago to 30,000 years ago, during the uppermost Pleistocene (Kreger 2005, Smithsonian 2007). Located were skeletons of three adult males, one adult female, and one infant. This appears to be a deliberate burial site, with body adornments found with the skeletons, such as pieces of shell and animal tooth in apparent pendants or necklaces (Kreger 2005, Smithsonian 2007). 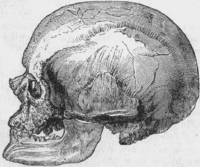 The type specimen from this find is Cro-Magnon 1, an adult male specimen. Also known as the "Old Man," Cro-Magnon 1 has a complete cranium except for the teeth and mandibular condyles (Kreger 2005). The skeletons showed the same high forehead, upright posture and slender (gracile) skeleton as modern humans. The cranial capacity is estimated at 1,600 cubic centimeters. Other specimens have since come to light in other parts of Europe and in the Middle East. The European individuals are thought to have probably descended from an East African origin via South Asia, Central Asia, the Middle East, and even North Africa (cromagnoid populations of Mechta El Arbi and Afalou bou Rummel). From the initial findings, it would appear that these early humans cared for one another to help survive the physical hardships of life. The type specimen shows evidence of a fungal infection, several individuals had fused vertebrate indicative of traumatic injury, and the adult female had survived for some time with a skull fracture (Smithsonian 2007). Given the life threatening nature of these injuries, it is believed that Cro-Magnons exhibited community support and took care of each other's injuries, as well as practiced the ritual of burial (Smithsonian 2007). Cro-Magnon's are believed to have had a varied and balanced diet, including meat, grain, wild carrots, beets, onion, turnip and other foods. Surviving Cro-Magnon artifacts include huts, cave paintings, carvings, and antler-tipped spears. The remains of tools suggest that they knew how to make woven clothing. They had huts, constructed of rocks, clay, bones, branches, and animal hide/fur. These early humans used manganese and iron oxides to paint pictures and may have created the first calendar around 15,000 years ago (Whitehouse 2000). The Cro-Magnons are assumed to have come into contact with the Neanderthals, and are often credited with causing the latter's extinction, although morphologically modern humans seem to have coexisted with Neanderthals for some 60,000 years in the Middle East, near the Mediterranean Sea (Bar-Yosef and Vandermeersch 1993), and for more than 10,000 years in France (Gravina 2005). Cro-Magnons appear to be associated with the "Great Leap Forward." After 50,000 BP, Jared Diamond, author of The Third Chimpanzee, and other anthropologists note that human culture apparently started to change at much greater speed: "modern" humans started to bury their dead carefully, made clothing out of hides, developed sophisticated hunting techniques (such as pitfall traps, or driving animals to fall off cliffs), and made cave paintings. Different populations of humans begin to create novelty in existing technologies. Artifacts such as fish hooks, buttons, and bone needles begin to show signs of variation among different population of humans, something that has not been seen in human cultures prior to 50,000 BP. This speed-up of cultural change seems connected with the arrival of modern humans, Homo sapiens sapiens. Theoretically, modern human behavior is taken to include four ingredient capabilities: abstract thinking (concepts free from specific examples), planning (taking steps to achieve a farther goal), innovation (finding new solutions), and symbolic behavior (such as images, or rituals). Among concrete examples of modern human behavior, anthropologists include specialization of tools, use of jewelry and images (such as cave drawings), organization of living space, rituals (for example, burials with grave gifts), specialized hunting techniques, exploration of less hospitable geographical areas, and barter trade networks. Debate continues whether there was indeed a "Revolution" leading to modern man ("the big bang of human consciousness"), or a more gradual evolution. Cro is presumably a dialectal form of creux, meaning "cavity" or "hollow"; such forms as crau, cro, crouè are found in French dialects, and all probably derive, through Vulgar Latin *crosus (not attested), from a Celtic root. Magnon is almost certainly the augmentative form of the Old French adjective magne, from Latin magnus, meaning "large" or "great" and ultimately deriving from the Proto-Indo-European language root meĝh2 (related to English much). Thus, the probable original meaning is "great cavity." According to information on display in Les Eyzies-de-Tayac, however, Magnon was simply the name of the proprietor who owned the land on which the cave is located when Lartet made his discovery in 1868. Bar-Yosef, O. and B. Vandermeersch. 1993. “Modern humans in the Levant.” Scientific American (April 1993): 94-100. Gravina, B., P. Mellars, and C. Bronk Ramsey. 2005. “Radiocarbon dating of interstratified Neanderthal and early modern human occupations at the Chatelperronian type-site.” Nature 438: 51-56. Kreger, C. D. 2005. “Homo sapiens: Introduction.” Archaeology.info. Retrieved August 31, 2007. Smithsonian National Museum of Natural History. 2007. Cro-Magnon 1. Smithsonian Institution. Retrieved August 31, 2007. Whitehouse, D. 2000. “Oldest lunar calendar identified.” BBC (October 16, 2000). Retrieved August 31, 2007.